JITENDRA KUMAR LAL S/O Late Rev. 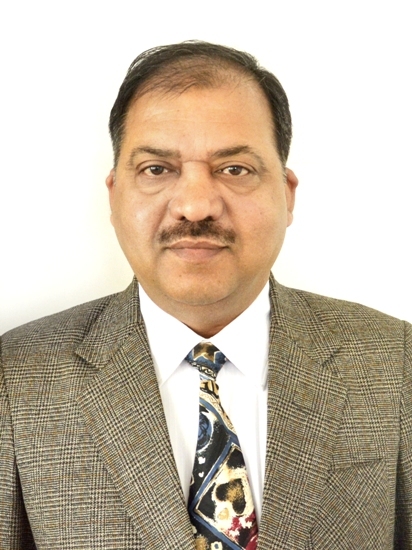 Kapil Deo Lal Born on 5th June 1960, Has Done M.Sc. in Chemistry with specialization in Analytical Chemistry and Ph.D. He has an teaching experience of more then 20 years to the Graduate and Post-Graduate students. Presently he is Principal and Secretary, St. Andrew's College, Gorakhpur, Member, Executive Council - 2004, D.D.U. Gorakhpur University, Gorakhpur. Chairman, Executive Committee, Gorakhpur Cricket Association, Gorakhpur, and Patron, District Council of Churches, Gorakhpur. (ii) "Vijai Ratna Award" & "Certificate of Excellence"
By India International Friendship Society, New Delhi. By International Business Council, New Delhi. (i) "Mathematical Concepts and Computers in Chemistry"
A study material of Physical Chemistry for B.Sc. students as imposed in latest unified syllabus by University Grant Commission. Published by - Agrawal Brothers Publications. For undergraduate & postgraduate students of Universities & Institutions. Published by - Rekha Publications. An essential course for graduation as imposed by State Government. Published by - Rekha Publications. Sponsored by University Grants Commission, New Delhi. (ii) Participated in National Seminar on Chemical Education at Purvanchal University, Jaunpur-1991. (iii) Visited and Worked in Chemistry Department of University of California, Los Angeles, U.S.A.
(iv) Participated in Enterpreneurship Training Programme at Lucknow during 27th January to 2nd February, 1992. Sponsored by Department of Science & Technology. (vi) Participated and presented a paper during 7th to 30th March, 1996 Refresher Course at Allahabad University, Allahabad. (vii) Participated and presented a paper in Symposium on Fundamentals of Crystal Growth at Crystal Growth Centre, Anna University, Chennai, during 6th and 7th November, 2000. (vii) Chairperson, Uttar Pradesh region, Student Christian Movement of India, Affiliated to World Student Christian Federation. Besides held various positions as examiner of Universities, Member of Selection Committees, on Boards as Director of Management of many Schools and Colleges, Committees of Diocese and other Societies. Phone Nos. - Office - 2332172, Residence - 2333917, 2500601.